A Mediterranean Diet is a style of eating based on the Southern Mediterranean region (i.e. Spain, Greece, and Italy). This kind of diet consists of a lot of vegetables and fruit, salads dressed with olive oil, fish, bread, pasta, and other grains. A recent 5 year study concluded that those on a Mediterranean diet reduce their risk of heart disease by 30%. Some participants even reversed heart disease while on the diet plan. src. The diet contains only small amounts of fish and poultry, and red meat is rarely eaten. The diet also contains low to moderate quantities of wine, and some eggs. In recent years the Sonoma Diet has taken the principles of Mediterranean eating and packaged them up into a very popular diet. 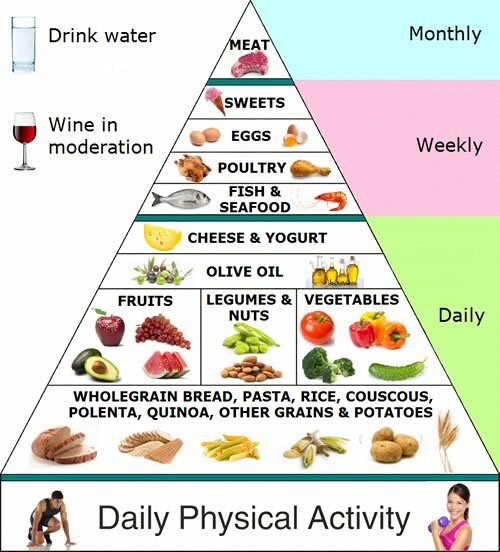 A Mediterranean Diet is inline with healthy eating practices. Olive oil is not a magic weight loss solution, but it is the predominant oil of the Southern Mediterranean. Good quality Olive oil is a good source of mono-unsaturated fat. The Mediterranean diet is all about enjoying food. Nice wine, flavorful spices, and delicious desserts are all part of this way of eating. Portion size should be watched carefully if you are aiming for weight loss, particularly with higher calorie foods such as oils. Wine (typically red wine) is consumed as part of a mediterranean diet – a glass a day with a meal is the norm. Fresh fruits and vegetables like apples, grapes, citrus, avocado, olives, cucumbers, tomatoes, squash, lettuce, kale, and spinach. Healthy oils like olive oil, nuts, and those found in fish. Protein from legumes, nuts, fish, chicken, eggs, cheese, and Greek yogurt. Beverages like Water, red wine, coffee, and tea. Carbs from pastas, breads, and whole grains. Spices and seasonings like garlic, oregano, basil, turmeric, rosemary, sage, balsamic vinegar, salt, and pepper. The Mediterranean Diet Lifestyle involves being active doing the things you enjoy. For example this could be long walks, bike rides, hiking, and swimming. Generally speaking, activity is part of the daily Mediterranean lifestyle and even involves things like house work and yard work. Increased food costs could result from following the Mediterranean diet. Buying quality olive oil, fish, fresh fruits, and fresh vegetables are required. Focuses on fresh, whole foods. Flavorful meal and food choices. Appeals to those who love red wine. Weight loss isn’t guaranteed unless strict portion control is practiced. May not address other health issues. Dairy is a large part of the diet. The peoples of the Southern Mediterranean area have a lower incidence of heart disease than in the West. This could be attributed to the lower levels of saturated fat in their diet. In addition the food choices and meals associated withy the Mediterranean diet are very flavorful and enjoyable to eat, which make it an easy diet to adhere to. However, those wishing to do the diet for weight loss purposes have to practice moderation and portion control in order to be successful. Additional reasons for popularity of the Mediterranean diet are 1) prolonged lifespan, 2) prevention of type 2 diabetes mellitus, 3) lower incidence of dementia, both Alzheimers and vascular types, 4) lower incidence of cancer (breast, colon, prostate, uterus). I think this is a very good diet that seems to have no side effects. 🙂 o canada our home and native land!